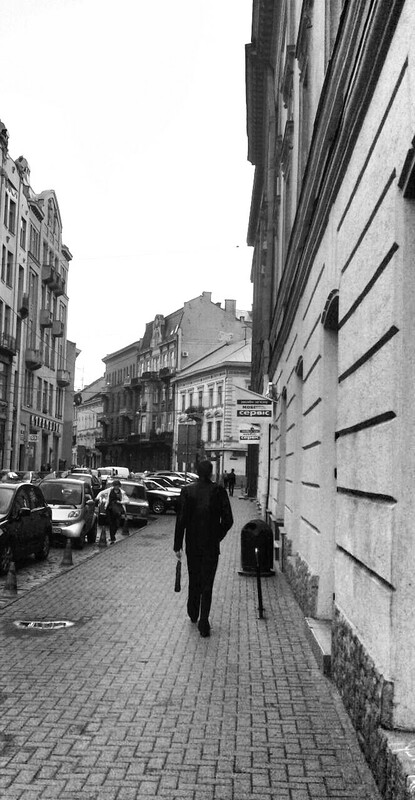 A jarring spectacle awaits those unsuspecting pedestrians strolling along Kopernyka Street in Lviv. Past the first floor shops and multi-storied apartment buildings piled one atop another there suddenly appears a fence of forged iron. Behind this stands the Potocki Palace. Here, set back rather incongruously, looks to be a bit of fin de siècle France. A feeling of the surreal pervades its placement on what seems to be the wrong street, in the wrong city, lost amid the wrong nation. It is a sight of fantastical surprise. Much of its magnificence stems from its unexpectedness. For all the wrong reasons the Potocki Palace is so incomprehensibly right. A palace in Louis XVI style on a side street off the main boulevard in Lviv, Ukraine, can it be real? How did it end up there, by incident or accident? Was it the product of pretentious gilded wealth? 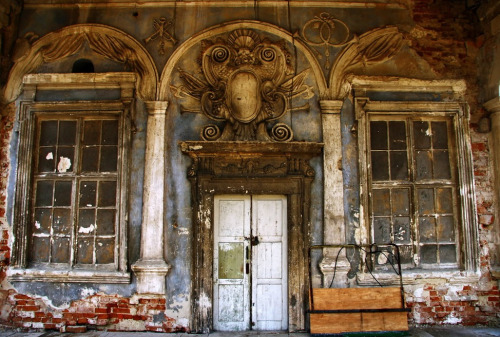 All of these questions come to mind because of what the Potocki Palace is and who built it. The palace consists of three stories and three halls, a Beaux Arts, late 19th century masterpiece. It seamlessly integrates classical, renaissance and baroque elements. It brings to mind a manor house gone mad with grandeur. The French stylistic influence is apparent, as it should be since it was first designed by a Frenchman then adapted by a local Polish architect. The interior contains marble fireplaces and ornate mirrors. It contains several colored rooms, including Blue and Red ones, where the walls at one time were covered in silks of the same color. There was a hall covered in mirrors, a touch of Versailles in what was to become and still is today Lviv’s most magnificent palace. Designed for meetings and official receptions, during the winter it hosted grand balls and banquets. Social gatherings warded off the depressing effects of dark, cold Eastern European winters. 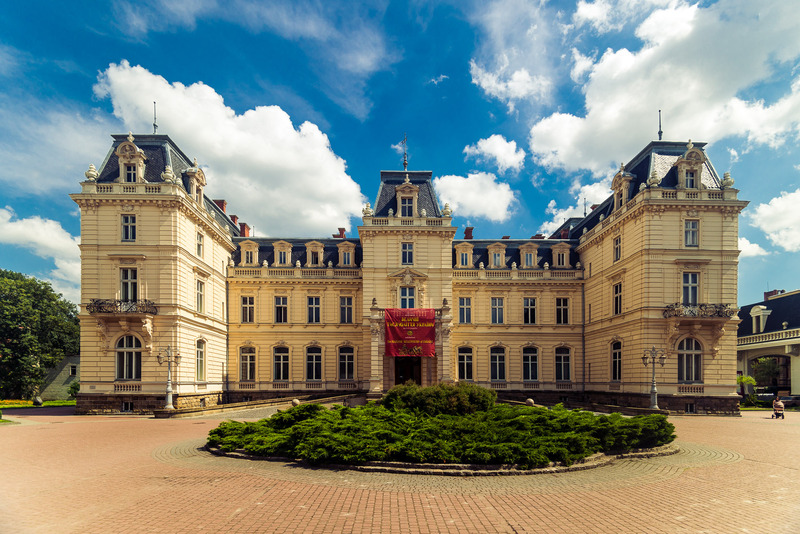 The Potocki Palace was the place to wine and dine Galicia’s glitterati. It was also a direct reflection of the family that it was named after. The Potocki’s were among the wealthiest aristocratic families in not only Galicia, but all of Austria-Hungary. They were rivals to all but the Habsburgs in fame, glamour and wealth. The Potocki’s were an ancient and noble Polish aristocratic family. Their lineage stretched all the way back to the beginning of the Middle Ages. Through the centuries they managed to acquire vast tracts of land and titles of nobility. They parlayed positions as military leaders and statesmen into political power in the Polish-Lithuanian Commonwealth. Following the Austrian takeover of Galicia in the Polish partition of 1772 the Potocki’s managed to insinuate themselves into the good graces of the Habsburgs with their loyalty. Through this strategy they became perhaps the most powerful of the Polish elites in Austria’s far eastern frontier. This was a mutually beneficial strategy, as the Habsburgs were not interested in pouring resources into the province, but rather extracting them. The Potocki’s were more than glad to assist them if it solidified their own exalted status. The land and structural holdings of the Potocki family were vast in the extreme. As late as the first half of the 20th century they held approximately 25% of the entire land area of Galicia. They owned at least forty chateaux, manor houses and palaces scattered across the province. Among these holdings were a mid-19th century hunting homestead on the edge of Lwow (Polish name for Lviv). It was owned by Count Alfred Wojciech Potocki, a politician and entrepreneurial businessman who had started sugar production and textile manufacturing businesses. He was intimately involved in political affairs as a member of the Galician provincial parliament and the Austrian Empire’s House of Lords. His political interests meant that he spent a good deal of time in Lwow. The count decided to have his hunting lodge pulled down. In its place, he envisioned the construction of a grand palace that would play host to dignitaries and officials from across the empire. This was the genesis of the Potocki Palace. 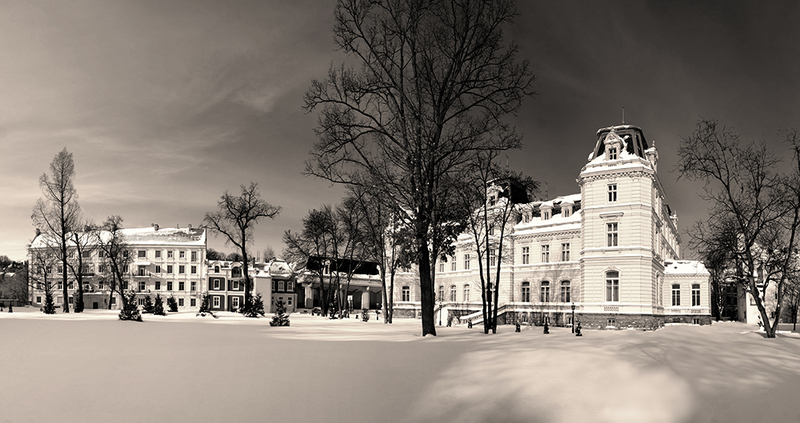 Following the imposition of Soviet rule, the Palace’s surroundings underwent radical change. Much of the adjacent parkland was developed into apartment blocks. The urban environment of the city encroached on both sides of the palace facing Kopernyka Street. Only at the front, where it was set back from the street, could those glimpsing through its magisterial gates perceive the depth which had originally been part of the design. This had been done to make the structure look like it was part of a park like setting. Such visual designs were now a thing of the past, as was the Potocki family in Galicia. The family’s surviving denizens had fled into western European exile. The role of the palace changed from the mid-20th century onward as it went through several iterations. Sovietization was imposed with characteristic thoughtlessness. Only a group of mind numbing Soviet bureaucrats could create such a name as the Institute of Geology of Mineral Resources of Academy of Science Ukrainian Soviet Socialist Republic. Fourteen words, ten that were polysyllabic and four of’s, added up to one long title that was quite a mouthful of banality. Nonetheless, this was one of several Cold War era titles and uses for the palace. It also gives an idea to the fall in prestige for this brilliant architectural creation. Later and much more appropriate, the Palace became a Civil Registry office for weddings. Marriages were finalized inside its grand halls. This was a bit of unintended aesthetic symmetry, since the palace’s exterior does seem to have a festive air about it. Wedding ceremonies still occur on-site today. After the nation of Ukraine formed in 1991, the palace was co-opted for use as a presidential residence. It can now be visited for those wanting to view the interior which contains the Lviv Picture Gallery of the European Art Museum. In a sense, the Potocki Palace has come full circle. Its walls are now home to magnificent works of art just as they were at its inception. The artwork is a good match for the scale and grandeur of the structure. The original intent of the palace as a magnificent home for meetings, banquets and balls has also been reestablished. 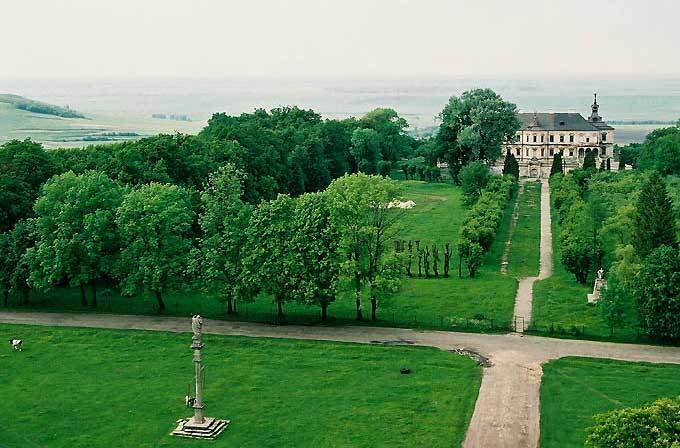 The Potocki Palace is a brilliant piece of the past surrounded by the present. A jaw dropping step stopper on a side street, it stands today as Lviv’s palatial pièce de résistance. Paradoxically it was the loss of Polish sovereignty that brought the longest period of prosperity to Pidhirtsi and its inhabitants. A long era of peace set in after the Austrian acquisition of southeastern Poland in 1772. By the end of the 18th century Poland had ceased to exist, but the Polish aristocracy remained. It was during this time that Pidhirtsi thrived as a residence par excellence. Visitors could enjoy a private zoo, several gardens and parks on the grounds. The castle’s interior was an exquisite series of eye popping chambers, including the Knights Hall, Golden Hall, Chinese Room and others named after a full spectrum of colors. The Green Room functioned as a virtual art museum unto itself with over one-hundred paintings covering its walls. The castle’s interior also held several hundred portraits. Floors were covered in marble tiles and each had a fireplace built from the same. Wild parties took place with an orchestra and theater on offer to entertain deep into the night. A guest inn on the castle’s west wing housed the visiting gentry. The glittering glory of Pidhirtsi later attracted such famous visitors as Emperor Franz Josef and Kaiser Wilhelm to the castle. Pidhirtsi was an immaculate conception of style, grace and culture for the Polish aristocracy of Galicia. Like everything else in this land, the First World War would prove its undoing. The long period of peace was lost forever to the outbreak of war. The grand balls and famous denizens at Pidhirtsi were forgotten in a matter of months as the echo of artillery grew louder by the day. This ominous manmade thunder shook everything in the area to its very foundations. Was the castle to be sacrificed on the altar of a worldwide conflagration? Pidhirtsi’s location in the borderlands of Eastern Europe had nearly been its undoing in the 17th century. The long period of peace as part of the Habsburg ruled province of the Kingdom of Galicia and Lodomeria turned out to be the golden age of the castle’s existence. When Austria-Hungary entered the First World War, Pidhirtsi was suddenly at the very center of conflict in Galicia. An era of unprecedented tumult was now inaugurated in what would become one of Europe’s deadliest regions during the first half of the 20th century. Thirteen of the next thirty-one years would be consumed by war. The castle was directly in the line of fire, quite literally. The Austro-Hungarian Army converted it into a headquarters for its 5th corps at one point, but this was not before the Russian Army had thoroughly looted the castle. The castle straddled the front lines for long periods of the war’s first two years. Amazingly it somehow avoided being shelled into ruin. That did not keep the Russians from knocking the insides of the castle out. Tiles were pulled up and walls torn down. 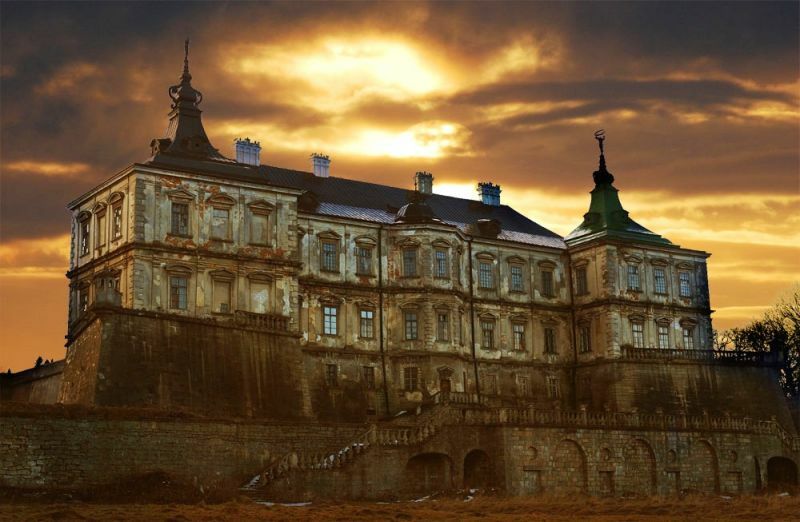 Incredibly, despite the destruction Pidhirtsi suffered, the castle was re-occupied by a Polish aristocratic family following the Soviet-Polish War, that little known conflict whereby Poland saved Europe from a widespread communist revolution. The years between the wars were a period of disquieting, uneasy calm. Seen in retrospect, this period was a last, final grasp at restoring the castle’s former greatness. This could not last. Pidhirtsi was part of inter-war Poland, caught between the hammer of Nazism and the anvil of Communism. To further complicate matters, its own backyard was a simmering cauldron of Ukrainian nationalism. When the Second World War broke out the owner of the castle, Prince Roman Sanguszko did the most prudent thing possible, he made himself and the last treasures of the castle scarce. They ended up in the safest place possible, half a world away in Brazil. When the Nazis took over the area, they found Pidhurtsi useful, as a place for their sick to convalesce. This may have healed physical wounds, but not the self-inflicted ones of an evil ideology. Fortunately the Nazis became like everything else at Pidhirtsi a thing of the past, only to be replaced by Soviet totalitarianism. The German Jewish philosopher Hannah Arendt famously theorized that German Nazism and Soviet Communism had more in common than not, both were equally tyrannical. When it came to their utilization of Pidhirtsi their commonalities were eerily similar. The Soviets also used the castle as a sort of hospital for those with tuberculosis. A trivial detail perhaps, then again it seems quite telling. The fact that both totalitarian systems could find no better use for what had once been an unparalleled palace of art and culture than a home for the wounded, sick and infirm says more about these two ideologies than any number of history books. They were trying to build a whole new world, but compared to what had once inhabited Pidhirtsi, it was nothing more than a decadent and depraved shadow world. Try as they might, the Soviets could not totally destroy the essence of Pidhirtsi, but nature and neglect nearly did the job for them. In 1956 a bolt of lightning set the edifice alight. Flames of impure fire burned the structure for three weeks straight. And yet the castle survived, albeit with innumerable scars. Now a mere shell of its former self, Pidhirtsi still maintained enough presence that its preservation was proposed by citizens of a new nation that would inherit this grandiloquent semi-ruin. Ukraine was born from the ruins of the Soviet Union, now Ukrainians would try to resurrect a past that had never been their own. It was decided in the late 1990’s that Pidhirtsi was a heritage worth securing for posterity. For the first time in its 350 year history the castle was turned into a museum, the Lviv Gallery of Painting, named for that famed city, ninety kilometers to its southwest. Restoration work began in an effort to restore the castle to at least a semblance of its former glory. The problem is that there is too little money in Ukraine to ever truly recreate Pidhirtsi in the image of its former glory. Perhaps this is best, since the aged, beaten look of the structure communicates the depth of history the castle has endured. The fact that it has outlasted every one of its owners and all of its conquerors is astounding. Unfortunately the depth and breadth of its past is often overlooked, obscured by a popular fixation with the legendary “Woman in White.” The tale is taken seriously by many. If only the rest of Pidhirtsi’s history could engender the same interest and recognition. The castle may be informed by myth and legend, but at its core is a history of both light and darkness much more fascinating than anything supernatural. The spirit of Pidhirtsi goes beyond ghosts, to a profound past that tells the story of a region, its struggles to survive and a beautiful, lost legacy.